This stage offers a few refills, then dumps us in some disgusting-looking water. Though this stage is just as ugly as the last, I do appreciate that it's pushing the dirty factory look a bit more; gives it a more menacing feel. The spikes at the end look like a nasty death for anyone jumping to the left from above, but it's fairly forgiving on that. The only way you'd be unable to avoid it is in you jump as far left as you can, and the previous stage trained players to stay toward the middle during drops. This is the first and only appearance of Big Fish, which jumps at players as they cross. It'll be late if you keep moving forward so it's not particularly dangerous, but only Quick Boomerangs or Crash Bombs can kill it. I like the spikes scattered around here. They don't actually matter since falling off the platforms would be a death anyway, but they're great for atmosphere. 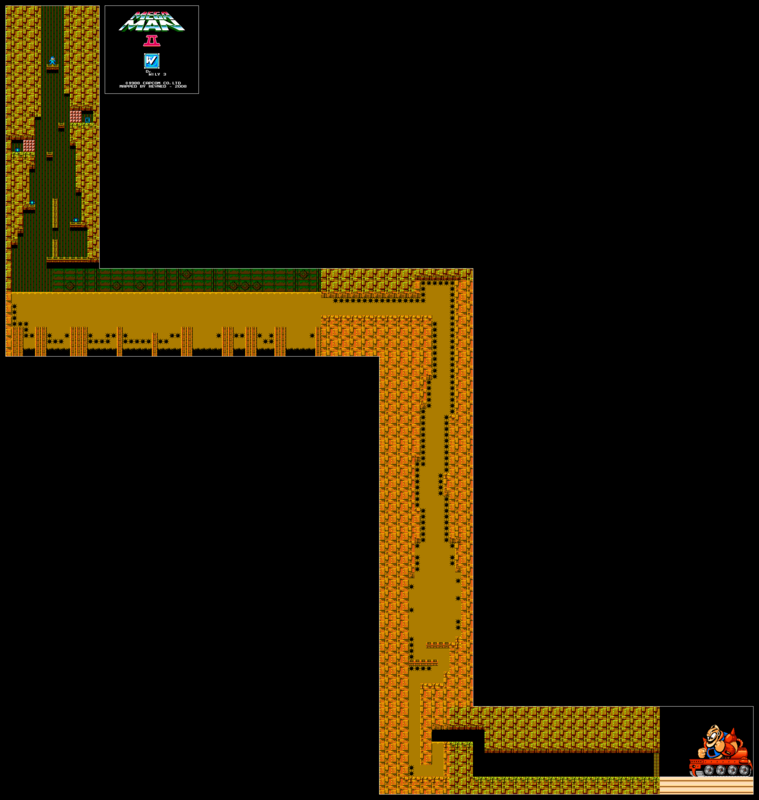 As with Quick Man's stage, this takes a limitation of the game's scrolling and turns it to an advantage. That pause between screens gives players a chance to see where they have to move, allowing for a gameplay element that would in no way be fair under normal conditions. After this is a hallway with a few Shotmen, followed by an actual boss door. Some tank treads enter from the right, followed by a fist, followed by... Guts Man? Looks like Wily gave up on the Guts Man army, instead turning him into one massive superweapon. Guts Tank tosses Mets at you while you're on the ground, and things look hopeless at first since nothing seems to harm him. However, the front part of his tank acts as a platform, allowing Mega Man to reach his face. Once you're up there, he'll start spitting out shots in a high arc. Like the dragon, he takes damage from every shot that hits him, so once the player figures the fight out it won't last long. Quick Boomerangs deal two damage, allowing you to end the fight in about four volleys. He certainly follows the stage's theme of being very imposing, but I wish he had the ability to fire off a Met or even throw a punch now and then while players are standing on him. As it is, he doesn't do much damage and his shots aren't that great at knocking players off. Most of the damage people take here is likely to be from collisions while working out how close they can stand or trying to jump on while he's moving. Still, it looks great and is an entirely new type of boss design for the series. He also gets a dramatic fade-out death. I like this one. It's quick and dangerous, and offers some things we haven't seen before. The only thing I'll complain about is the music. It's just a few notes that raise slowly in pitch for a long time before abruptly resetting, which makes sense for raising tension and all that but is very grating on the ears.